Streamline visualization from a simulation of a quad rotor in flight. Image from Symscape. Symscape illustrates the use of a Moving Reference Frame (aka frozen rotor model) for simulation of a quad rotor helicopter. Part 3 of a series of articles on pump cavitation analysis using CFX focuses on post-processing the CFD results. Intelligent Light‘s most recent email newsletter includes information on the upcoming FieldView 14, IL’s involvement in the most recent AIAA High Lift Prediction Workshop, and more. If you’re curious about how CFD would work in the cloud, take 7 minutes to watch this video of an external flow calculation with Ciespace. CD-adapco released STAR-CCM+ v8.04. This latest version includes improved solid modeling capabilities for working with CAD data, new propeller modeling, and an adjoint solver among other things. 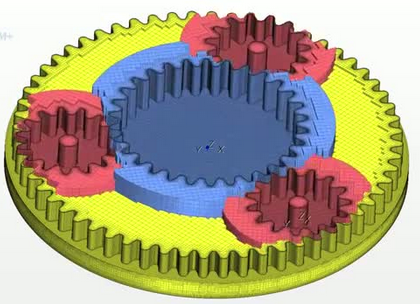 Screen capture from a video illustrating STAR-CCM+’s overset grid capability for a gear simulation. Image from CD-adapco. Flow Science has made available the proceedings of their 13th FLOW-3D European Users Conference (registration required). Your intent to participate in the 1st AIAA Sonic Boom Prediction Workshop is due by 01 July. The workshop will be held in conjunction with AIAA SciTech 2014 in January. The Code_Saturne Team announced the availability of presentations from their user meeting. Turbulence certainly is an enduring challenge for fluid dynamics (brief article and video). If you have 30 minutes to spare you can hear an interview with Rand’s Ryan Stamm on CFD consulting. Here’s the best of the visualization web for May 2013. 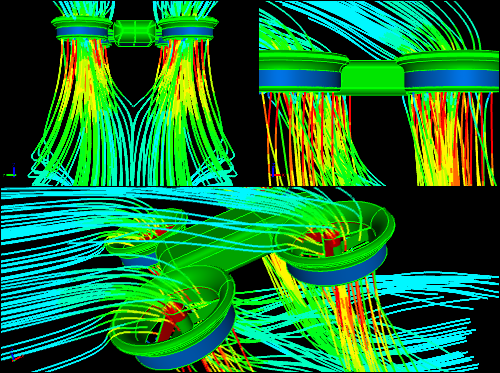 ANSYS eNews has been published for June 2013 and includes an article about magnet simulations. CFD Online introduced a discussion forum for Exa. Certainly you’ve seen the video of the flying bike. This proves that propulsion guys can make anything fly by strapping on a big enough engine. 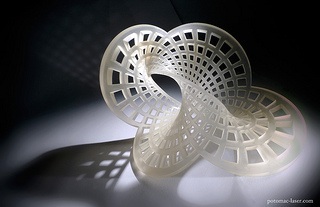 3D printed Mobius strip by Henry Segerman. Image from FabLabNyack. This entry was posted in Applications, Events, News, Software and tagged 3D printing, ANSYS, CD-adapco, CFX, Ciespace, Code_Saturne, Exa, FIeldView, Flow Science, FLOW-3D, Intelligent Light, STAR-CCM+, Symscape. Bookmark the permalink.